It felt like home. It could be easily a bachelor’s studio apartment. Very spacious, functional, with all necessary kitchen equipment, spotless clean, felt like new. The balcony was great with awesome panoramic view of the whole town and sea. Great location 5 minutes by car from town, on the hill, which means quiet and cool breeze. Nice luxury touch the Egyptian cotton towels! Friendly and helpful hostess. Ένας πεντακάθαρος και όμορφος ξενώνας πάνω από την πόλη της Λευκάδας .Η θέα είναι φανταστική. Άνετο και καθαρό μπάνιο. Κουζινακι ψυγείο και μεγάλο μπαλκόνι όπου μπορείς να καθίσεις και να απολαύσεις το πρωινό σου. 5 λεπτά από το κέντρο. Η κυρία που μας εξυπηρέτησε πολύ ευγενική.θα το επισκεφθούμε σίγουρα ξανά! Struttura immersa nella quiete, appartamento ampio, confortevole e moderno. Pulizia ottima. Disponibilità e cortesia della proprietaria. Il panorama, la cortesia dei proprietari e il comfort dell'appartamento. Cucina e bagno sono dotati di tutti gli accessori possibili e immaginabili. La pulizia conferisce ulteriore pregio alla struttura. Il nostro cane è stato accettato e ben voluto! Lock in a great price for Irida Hotel – rated 9.7 by recent guests! 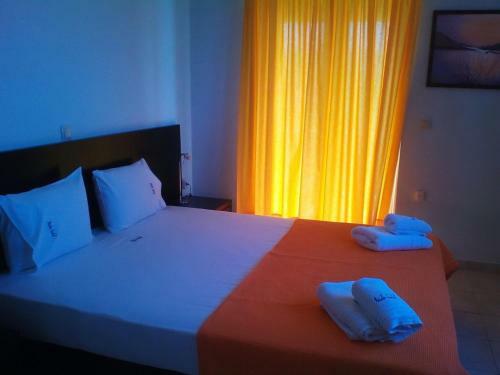 Irida Hotel This rating is a reflection of how the property compares to the industry standard when it comes to price, facilities and services available. It's based on a self-evaluation by the property. Use this rating to help choose your stay! With a panoramic view over the valley of Rachi and Amvrakikos Gulf, Hotel Irida is only 1.2 mi from Lefkada Town. The family-run hotel offers self-catered accommodations with private balconies or terraces. The air-conditioned studios and apartments are fitted with tiled floors and include wall-mounted flat-screen TVs. Each has a well-equipped kitchenette. Free Wi-Fi access is provided throughout the property. Irida is located 1.9 mi from the island’s port and 2.5 mi from the nearest sandy beach. The airport is at 9.3 mi. Guests also benefit from free parking facilities. This property also has one of the top-rated locations in Apolpaina! Guests are happier about it compared to other properties in the area. This property is also rated for the best value in Apolpaina! Guests are getting more for their money when compared to other properties in this city. When would you like to stay at Irida Hotel? Spacious studio with fully equipped kitchenette, fridge, LCD TV with satellite channels, big bathroom with hairdryer and balcony with views. Spacious studio with fully equipped kitchenette, fridge, LCD TV with satellite channels, big bathroom with hairdryer and balcony with views. The third and fourth guests are accommodated on a fold-able bed. In Irida hotel you will discover an environment of relaxation and concentration, ideal for those who enjoy their holidays in Lefkada. It is the ideal base to explore the island, walk the town, for entertainment or very peaceful holidays. Irida hotel is the family business of the brothers, Dionisios and Anastasios Livitsanos. 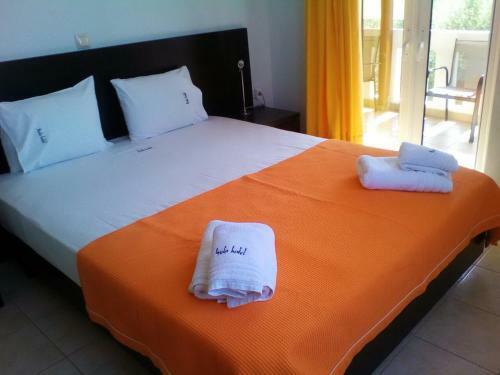 Irida hotel is ideal for beautiful holidays of couples, families and elderly. A selection of beautiful rooms, impeccable service and amenities that will complete with the best possible way your stay in Irida hotel. We are Livitsanos brothers and we are proud of our property. Our mission is to offer you unforgetable vacations by supporting and serve you in every aspect of your needs. Everybody is welcome to experience this! Irida hotel is located 2 kilometers away from the town of Lefkada, in Rahi hill surrounded by olive groves. From there, you can enjoy the unique view towards the town of Lefkada, the lagoon, the Castle, Ammoglosa, Yira, Amvrakiko gulf up to the mountains of Epirus and Akarnanania. House Rules Irida Hotel takes special requests – add in the next step! Irida Hotel accepts these cards and reserves the right to temporarily hold an amount prior to arrival. Please inform Irida Hotel of your expected arrival time in advance. You can use the Special Requests box when booking, or contact the property directly using the contact details in your confirmation. No big deal but the last 200 meters of road before reaching the hotel is dirt. The property is located very close to the Lefkada city center, about 2 or 3 km away (about 10 minutes by car). Since we spent a lot of time looking for places to stay, we have found this one just perfectly located in order to have direct and fast access to everything. It is placed in a very quiet area as well. It is overlooking the city, the sea and the mountains in the very far distance, an all-in-one view you can enjoy in the mornings or in the late evenings spent in own private outdoor space or the common spaces at the upper-floor. It also has a bar-style open space for sightseeing we always spent few minutes relaxing on our way to the parking space or when returning to the room - great ambiance and relaxing music (some photos attached to the review). The room was large, great storage space for clothing and luggage, fully equipped kitchenette. Very clean and neat. Last but not least, the hosts are very nice and helpful people. They offered us information about the island, beaches, places to spend time, eat or order food (maps and brochures at the reception). Thumbs up for the way they manage the property, making things just right for a pleasant stay! Definitely we’ll consider re-visiting the property! Highly recommend! !